Estreeme the Meerca had hit a rough point in her life. She had escaped the pound, struck out on her own with dreams of doing something amazing. Maybe open a shop in Neopia Central or travel to someplace her owner had never taken her. Clinging to that last dream, Estreeme had found herself traveling to Moltara. For a moment it had been great, the city surpassing anything her imagination had created. Wonders of all shapes and sizes, all manner of gizmos and gadgets, and the native people with their Magma color looking so striking. It had been a dream come true. That dream crashed down when night fell, as Estreeme found herself with nowhere to stay and no neopoints to buy food. She wandered the street until she came across an incredibly odd looking house. In fact it look as if it belonged in the Lost Desert, yet here it was in the middle of the molten city. Looking around and weighing her options, Estreeme decided there was no point in not trying her luck and knocked on the door. How unaware she was that after knocking in that door, her luck would change forever. The concoction in front of Dr. Finneus Steamcog bubbled absently as he scribbled notes in a weathered notepad. It was covered in some sort of faux hide a colleague of his had created. She was more environmentally conscious then most, and had been spending most of her time recently fighting against the continued sale of Stick-O-Mynci. He was actually experimenting with a new type of morphing potion for her, one that would change any Mynci into a less (apparently) tasty treat. He was getting mixed results, and as a whole wasn't sure he would ever get the mixture right. The side effects varied from a simple gender change to full out species transmogrification. As Finneus continued to observe his latest attempt, Gillsteam, a Koi and one of his two apprentices, burst into the room. Uncharacteristic for him, as he was usually more observant of common courtesy. "Gill, I'd have thought I didn't need to tell you to knock when I'm workin," Finneus said without looking away from his notes. "Yes sir... sorry, sir," said Gill breathlessly, "it's just... there's been a development." "Development?" replied Finneus, while jotting down a new note. "Yes! Development. New thing. Person. Neopet. There's a new Neopet," Gill excitedly said. At this Finneus did turn around, looking at Gill with budding curiosity. "A new Neopet? As in a new species? There hasn't been a new species since the Lutari!" Gill shook his head ferociously, "No! Not a new species! I mean... 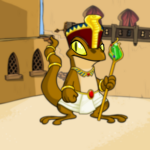 I mean a new Neopet here! A Meerca! She just showed up at our door." Finneus sighed, clearly disappointed. "I'm not interested in buying anymore codestones. I'm studying at the Academy at Krawk Island now." "Sir, she's not here to sell codestones. I think her owner abandoned her. She has nowhere to go so I offered her my quarters for the night, I figured I could just sleep on the couch for tonight. She's in the Atrium right now, eating some of that left over omelet from our Tyrannia excursion," said Gill, avoiding eye contact. Finneus walked away from his potion, which was now bubbling and making an odd whistling noise, towards Gillsteam and put an arm on his shoulder (or the closest thing to a shoulder a Koi can have) and smiled. "Don't be so nervous, Gill," he said reassuringly, "I would have done the same. Now please dispose of," he looked back at his now failed experiment with mild disgust, "that." Gill hesitantly approached the potion, now sprouting a tentacle and verbally making Neopia Stock Market predictions, as Finneus left the room. Estreeme had suddenly found herself in a very strange location. The walls were covered in all sorts of devices. Some looked helpful, some looked to be made from the battledome, and some looked like the inventions of someone completely crazy. Actually, Estreeme was pretty sure one of the things on the wall was just a spoon with a smiley face drawn on it. She continued to look at the walls as she devoured the omelet that nice Koi had given her. He had been so worried for her, and it was reassuring to see that someone could show kindness. She'd been surviving off the kindness of strangers ever since leaving the pound. However, she knew from experience she had, at most, a day to enjoy this new roof over her head. Finneus wiped his hands clean with an old rag as he entered the Atrium. A shaken and, apparently, starved Meerca was busily munching away at two thirds of a cheese omelet and nervously looking at all of the strange machinery that cluttered the room. As Finneus walked in, he cleared his throat. This caused the Meerca to visibly jump. "Hey now, take it easy. I'm Dr. Finneus, I own this home," he said, holding his hands up. "You're a Techo?" the Meerca said, still looking a bit nervous. "Well, yes. I am. Why does that surprise you?" asked Finneus, looking a bit offended. "Oh sorry! I don't mean to sound so surprised! I've just... well... I've never met a Techo. My last owner just had myself and a Lenny," said the Meerca apologetically. "No worries," laughed Finneus. "I was a Lenny for a while myself. Friend of mine needed help testing his lab ray. Heck, before that I was a Yurble! My owner changed that the old fashioned way, though, potion down the gullet. It's been quite a ride." Seeing the bewildered look on the Meerca's face, Finneus made a quick decision that talking about all the strange experiments that were a part of his daily life may not be the best ice breaker for a scared Neopet. He decided to switch tactics. "Never mind all that, do you have a name?" asked Finneus with a kind smile. "Estreeme. Everyone, but my owner, called me Es," said Es, who had now begun to take more bites of her omelet. "Well then, Es, I'll leave you to your meal. When you finish, come find me in one of the laboratories. I have some work I need to attend to," Finneus said as he began to get up. Just then, Gill came screaming through the room, "It's self aware! The experiment became self aware! Fyora help us, it's coming after me!" he yelled before continuing to flee. Finneus' eyes followed the terrified Koi. "That cannot possibly be good," he said matter-of-factly. Es nodded. "I'd agree with that. Should we run?" Finneus was already sprinting out of the room. "I'd most assuredly advise that! Follow me!" Es dropped her bite of omelet and chased after Finneus, who was catching up with Gill. "Gill!" yelled the Techo scientist. "Where's that new Ruki apprentice I just hired!?" "Mortimer? He was in Lab 4 taking measurements on those new weapons you picked up for the Obelisk War! Should we get him?" yelled back Gill. "Save him by taking him out of the room filled with experimental weapons? I think it may be more prudent to head to that room for an entirely different reason!" Finneus called back. "Wait, are you suggesting we fight it!? Doc, it's almost two stories tall now! We have to run! Abandon the lab!" screamed Gill. "Abandon the lab!? Nonsense! I have no intention to fight my created creature! There's an experimental Freezer in that battledome cache! We can use it to stun my abomination and transport it somewhere away from innocent Neopians! Somewhere I can still study it as well!" Finneus hollered back with a hint of glee in his voice. "You're completely insane Doctor!" Es added. "Thank you, Es! I prefer Mad Scientist, though! Has a better ring!" laughed Finneus. The Creature let out a monstrous bellow that could be heard throughout the entire Neohome. Just as it began to gain on the fleeing trio, the group reached the door to Lab 4. Mortimer was just exiting, rubbing his eyes sleepily, before being tackled back into the room by Gill with Finneus close on his heels. The Creature was right behind Es as she tumbled into the room. A massive red eye lined up with the doorway, and just as a massive tentacle was about to slither in, Finneus slammed his hand onto the door control, safely sealing them in. Apprentice Mortimer was staring at the closed door. "Uhm... Doctor Finneus? What was that?" said Mortimer in a tone that implied he wasn't at all surprised by these new events. "Nothing, Apprentice Mortimer. Simply an experiment gone a bit awry. Tell me, have you been able to test that new Freezer?" Finneus replied calmly. "The Randomly Firing Freeze Ray? Yes, I have," said Mortimer. "Is it reliable?" asked the Doctor. "Well, you know, it's a bit random," Mortimer said sarcastically. Finneus sighed. "Just give it here, will you?" Mortimer handed over the small Freezer. It was purple with an orange handle, and to Es it quite frankly didn't look all that powerful. Finneus seemed to test its balance in his hand. Looking unsatisfied, he turned to Gill. "Apprentice Gillsteam, I require your... assistance," said Finneus, turning to his apprentice. Gill looked at the Doctor and then to the Freeze Ray. "Oh no..." He began to back away. "Oh yes, Apprentice Gillsteam. I promise it's for our survival," Finneus said as he leveled the ray at the now panicking Koi. Gill closed his eyes and braced himself. "I hate my job," he muttered under his breath before a blast of ice enveloped him completely. Finneus walked over and observed the frozen Koi. "Funny, you almost look like a Fish Pop," he mused. "Speaking for Apprentice Gillsteam, sir, that is offensive to the Koi species," Mortimer piped in. "Well, once Gill has ceased being a popsicle, I'll be sure to apologize. Moving on." Finneus looked down at the Freezer and reappraised it. "This works quite well. This will do nicely." "Good to hear, sir, but before you go off pretending to be a Defender of Neopia, perhaps you should address the weeping guest cowering in the corner of the room," said Mortimer. Finneus looked over at Es, who was indeed crying in the corner. He walked over and sat down next to the shaking Meerca. Who immediately scooted away. "Hey now, it's ok. I've got this handled. I'm a Doctor." He flashed her a smile and saw her begin to calm down. "I know it's a lot to take in, and I know you're already confused. Being abandoned by your owner can do that. I want you to know I have this under control, and once this situation is handled I promise things will seem a lot more normal. Stay here with Apprentice Mortimer." Finneus stood up as he finished speaking and, gripping the Freeze Ray, grimly walked towards the door. "Good luck, sir," called out Mortimer, while attempting to defrost Gill. "Don't need luck." Finneus smiled. "I've got science to fall back on!" Laughing wildly, Finneus opened the door and was immediately grabbed by an oozing tentacle. With a surprisingly intimidating war cry, the Doctor began to wildly fire the Freeze Ray. The door closed, leaving Mortimer, Gill, and the little frightened Meerca to sit and listen to what sounded like quite an epic battle. After what seemed like too long, they all heard a labored knock on the door accompanied by a familiar voice. "Excuse me, but if you could come out here I could use a bit of assistance getting this creature somewhere safe," said Finneus. "Also, Gill, I'm sorry for calling you a Fish Pop." Gill, who by now had defrosted fully, looked at Mortimer and, with a belabored sigh, opened the door and went to join their mad scientist. Leaving Es to once again sit and listen to the noises outside. After another long while, a before unseen PA system buzzed to life and filled the room with the exhausted voice of the Doctor. "Es, please meet me in the Atrium. You know, where you ate the omelet. We need to discuss your staying here." Es stood up and sighed to herself. She knew this part. Where she was sat down and told that, while she was a great Neopet, she wasn't exactly a good fit for this home. She walked to the Atrium and saw Dr. Finneus sitting where she had sat, sipping a cup of tea. She sat down next to him. "Would you like some? It's dung. I got a taste for it when I visited Tyrannia," Finneus said while offering Es the kettle and a cup. She looked at the drink with a thinly veiled look of disgust. "You know, I think I'll pass this time," she offered politely. "Suit yourself. To the business at hand then, meaning your stay here," Finneus said while taking another sip of the rancid drink. "Look, I understand and I appreciate all that you've done, even if it was perhaps the most terrifying experience of my short life. I'll just need a couple of minutes to collect my things and-" Es was interrupted with a raised hand from Finneus. "Es, we want to ask you to stay on with us. Become my third apprentice with Gillsteam and Mortimer. You'll have a home and everything you could want, what do you say?" At this, the Meerca looked at Finneus. "Your owner would adopt me?" she asked incredulously. "He would. He's a big softy, to be honest. Fancies himself a writer as well," Finneus said with a reassuring smile. "He's good to us, keeps us fed and keeps us happy. You'd do smashingly here." "One condition," said Es with a smile beginning to form. "No shooting me with crazy experimental battledome weapons," she said with a laugh. Finneus laughed as well and offered his hand. "Deal," he said as she gripped his hand and shook it firmly.